The books tell the stories of two refugees, one who fled Iraq into Syria and then had to flee Syria to the United States — long before Trump’s Muslim ban. The other story is about a Syrian refugee who barely survived the treacherous crossing from Turkey to Europe to resettled in the far more welcoming country of Sweden. Both stories are about the real cost of war — a cost few Americans ever get to see. Most of the coverage of wars in the Middle East focus on terrorism. When they do report on victims, their subjects are mostly American soldiers. Seldom do we see the horrific cost of war on civilians, yet they are the ones who suffer the most. 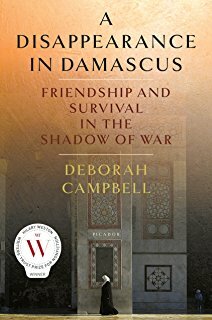 But for journalist Deborah Campbell, civilians are the story. She practices “immersive journalism”, embedding herself among the refugees she reports on, many of them women and girls. She reported from Iraq and then, when Iraqis streamed into Syria by the thousands to escape sectarian violence, she went to report from the Iraqi refugee enclave of Damascus. Looking for a fixer to help her get sources and translate, Campbell found Ahlam, a courageous and capable Iraqi refugee who not only worked for journalists but also helped her fellow refugees in a myriad of ways, including founding a school for teenage girls. The two developed a strong working relationship and then a friendship forged by the risks they took in Syria’s police state. Then Ahlam went missing. In a compelling narrative, A Disappearance in Damascus tells the remarkable story of Ahlam and Campbell. Through that story, it illuminates the larger one: how the decisions made by the U.S. to intervene militarily in Iraq and Syria have sown chaos and catastrophe in the lives of the civilians of those countries. But, they are fleeing terror and destruction in their own country: terror from bombs dropped by Russia, the US and their own government and destruction of their homes and communities by both government troops and the opposition. According to Amnesty International, 2017 is set to be the deadliest year for refugees and migrants crossing the Mediterranean. Back in March, we spoke with UNHCR spokesperson Melissa Fleming about her book, A Hope More Powerful Than the Sea: One Refugee’s Incredible Story of Love, Loss, and Survival. 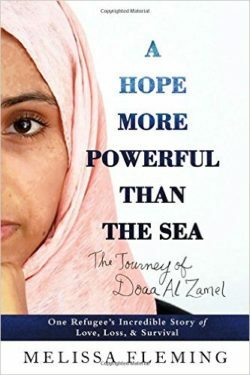 It tells the story of Doaa Al Zamel, a young Syrian refugee who survived a harrowing journey across the Mediterranean Sea from Turkey to Italy. Doaa was one of about 25 survivors out of 500 whose boat was deliberately attacked by smugglers. Her fiancé, the love of her life, did not survive. She floated in the sea for days carrying two babies in her arms, whose parents had handed them to her before they drowned.